Week two of the college football season was literally toxic for the Mountain West as the conference went a combined 1-7 with only San Diego State securing victory over Army. The Mountain West dropped games to schools from the following conferences Big 12, Big 10, Pac 12, MAC, Big East, Big Sky and the Missouri Valley. That isn’t exactly a banner day for a conference fighting for national relevance and respect. The lossess to the Big Sky and Missouri Valley are embarrssing for the conference and should be uber discomforting for Colorado State and UNLV who dropped these games at home! It is early yet so do not read too much into the toxic standings but there are signs of concern for the Cowboys. Just two games in Wyoming is -4 in turnovers (with a -2 overall toxic rating) but will have a chance to clean things up this weekend against lower division Cal-Poly. San Diego State (+6) jumped to the top of the pile with a dominating win over Army and Hawaii (-10) remains on the bottom after a bye week coming off a loss to USC. 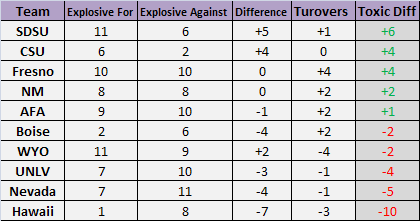 Click below to see this week’s complete toxic standings.